Back at Prior Lake Senior High School, the turtle-necked, bespectacled, and fearsome Ms. Arlys Johnson positively insisted that I and countless others learn proper comma usage. She was tireless as she drilled us, unswerving in her demands that we Get It Right Already. I took her – and the comma – very seriously, solemnly indoctrinating my brain with comma rule after comma rule. I feel lucky that, ever since, I've had a fairly firm grasp on the comma, adopting it as a sturdy, curved-end walking stick that's supported my writing throughout my life. I totally get that not everybody took Ms. Johnson – or her comma lessons – nearly as seriously as I did. Just as others find value and interest in things I can't pretend to understand (e.g., golf, doomsday prophecies, gambling, manicures), I don't expect everyone to have time for the comma. So if you are happy with your comma abilities, that's truly fine by me; please proceed in having a splendid day. I do expect, however, that if your JOB has anything to do with putting examples of printed English in front of the masses, you should try very hard to get commas right. I am daily frustrated by the comma errors I see in articles published by prestigious publications, in the Facebook-posted headlines on articles, in advertising, and on websites. Don't perpetuate the problem, y'all. INCORRECT: "He was born in Cincinnati, Ohio in the back of a taxi." CORRECT: "He was born in Cincinnati, Ohio, in the back of a taxi." NON-TECHNICAL EXPLANATION: In the first sentence, leaving out the comma after "Ohio" means that you're implying the state of Ohio is in the back of that taxi. To avoid trying to shove an entire state in the back of a taxi, you ALWAYS need to set off the state with commas on both sides. INCORRECT: "On July 4, 1776 the United States Congress debated, revised, and approved the wording of the Declaration of Independence." CORRECT: "On July 4, 1776, the United States Congress debated, revised, and approved the wording of the Declaration of Independence." NON-TECHNICAL EXPLANATION: In the first sentence, leaving out the comma after "1776" means that you're suggesting that something called "1776 the United States Congress" exists, and that they were the ones messing about with the Declaration of Independence. Again, in all situations, you need to set off the year with commas on both sides. INCORRECT: "Sheryl Sandberg, Chief Operating Officer was the first woman to serve on the board of Facebook." CORRECT: "Sheryl Sandberg, Chief Operating Officer, was the first woman to serve on the board of Facebook." NON-TECHNICAL EXPLANATION: In the first sentence, you're telling Sheryl Sandberg that someone named Chief Operating Officer was the first woman to serve on Facebook's board – not her. That being said, it is ALSO correct to write the sentence like this: "Chief Operating Officer Sheryl Sandberg was the first woman to serve on the board of Facebook." In this case, no comma is needed. CORRECT: Most of these examples are so ridiculous and/or amazing, you'll know immediately where the commas should have resided. 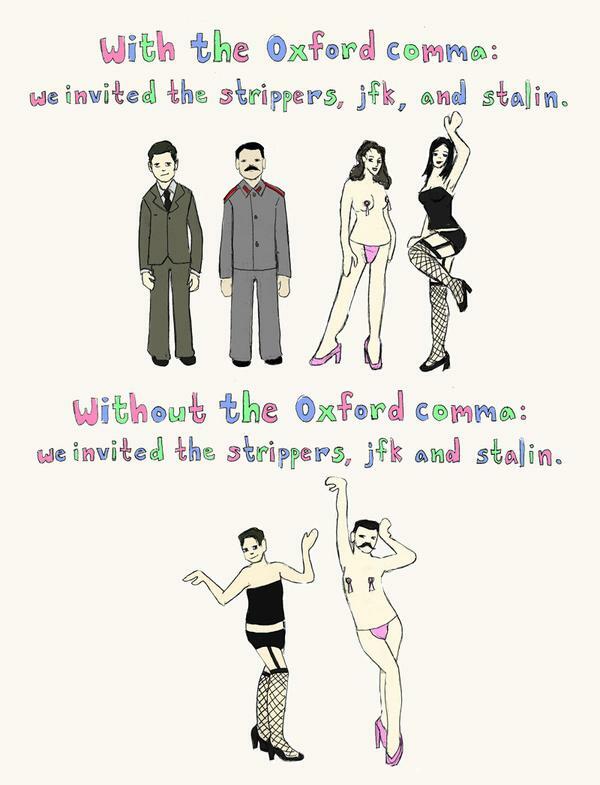 NON-TECHNICAL EXPLANATION: I love the Oxford comma, and for the most part, I use it every time. I love the clarity of it. Don't risk cooking your family and your dog. NON-TECHNICAL EXPLANATION: In the first sentence, you are telling someone not to eat, but rather to paste. That's not likely what you mean to say, eh? INCORRECT: "I don't need, to hear that song today because, it's putting me in a foul mood." CORRECT: "I don't need to hear that song today because it's putting me in a foul mood." NON-TECHNICAL EXPLANATION: Some people like to put commas in where they hear themselves taking a breath. Sometimes they're right to do this; often, they're wrong. Ask yourself if the comma is genuinely needed to help someone understand your sentence. If it isn't, leave it out. INCORRECT: "My stomach hurts, because I ate paste." CORRECT: "My stomach hurts because I ate paste." NON-TECHNICAL EXPLANATION: I'm trying not to bore/lose you with technical terms, but I'm going to use a couple here: independent vs. dependent clauses. Put simply, if your "clause" – your sentence segment – can stand alone and have meaning, it is an independent clause. If it cannot, it is dependent. In the above example, "because I ate paste" cannot stand alone. While "My stomach hurts" can stand alone, we are choosing to give more information in a dependent clause – so you need to keep the comma out of it. INCORRECT: "I hate to say it, but I really hate when people use commas incorrectly, because they don't know what they're doing, and it ends up being a bad, self-perpetuating error that causes yet more bad punctuation, and I can't even handle it. CORRECT: "I hate to say it, but I really hate when people use commas incorrectly. They don't know what they're doing. It ends up being a bad, self-perpetuating error that causes yet more bad punctuation. I can't even handle it." NON-TECHNICAL EXPLANATION: Run-on sentences are everywhere. In my personal writing, I myself lack discipline in this area. Sometimes I try to tell myself it's "charmingly stylistic" or somesuch, and I think back to how maybe I *have* read a little too much Kerouac. But when I'm writing to make someone else look good, I must be disciplined. And so the basic rule is as follows: if it can stand alone, let it. And with that, I'll jump off my comma-laden soapbox for today. While there are indeed countless more ways you can screw up your comma usage, these are the ones I see the most. And if I can simply help to skim a modicum of these comma errors off the top, I'll have done my duty. Before I go, however, one more thing: Ms. Arlys Johnson – if you're still out there – thank you for showing me your comma ways. While I eventually learned that I didn't need to fear you, and that in fact you had a sharp, dry, and always on-point sense of humor and a rare but welcoming and wry one-corner-of-the-mouth smile (hilariously supplemented by Juicy Fruit gum), I never stopped fearing your wrath as it related to the ill use of commas.